Here is our April Newsletter with lots of information on P7 transition, whos’ been visiting us and who we’ve been visiting, some new children at school and lots of achievements to celebrate. Here are the minutes from the Parent Council Meeting, we are starting to organise the summer fair so if ou can help in any way please contact a member of the Parent Council or ask at reception. The regular attendees at the meetings are listed on the minutes. Before the Easter holidays Primary 1 had been learning about the signs of Spring and the Easter Story. The pupils made fantastic daffodil flower picture which really brighten up our classroom. They also made Eater bonnets and went on a parade to show them off to the rest of the school. On the last day of term we had lots of fun on an Easter Egg treasure hunt which led us to the staffroom and to lots and lots of chocolate eggs! We have started the new term with Health Week and have been dancing in the playground with ‘Kick start’, trying lots of healthy food such as mackerel and avocado, learning what to do if somebody got hurt with Mrs. Campbell, a visit from Mrs. Reid who reminded us about the importance of wearing a helmet when we are on our bike and then a healthy bear orienteering activity. What a busy week! We will be starting our Olympics focus the week beginning the 30th April where we will be learning about the history of the Olympic and Paralympic games and their values. We will also be learning more about Jamaica. On Tuesday 17th April, we welcomed 22 students and 2 teachers from Helsinki in Finland to Lasswade Primary to meet with our P7 class. We had a lovely day working together sharing information about our different cultures, geography and history. The children had the opportunity to taste some Finnish foods such as mammi (Easter pudding), rye breads, Finnish chocolate and salt liquorice. We learned how to play Mollky (a bit like skittles) and had a competitive game outside. A traditional Scottish lunch of haggis, neeps and tatties was served for lunch with Irn Bru, shortbread and Edinburgh Rock. The day was completed with some Scottish Country dancing led by Karen Campbell and our P7 children singing Flower of Scotland and Auld Lang Syne. As we are using a new supplier for our school uniform there will be sessions where you can try everything for size and also take the opportunity to buy some older stock at discounted prices. The final session for this will take place on Friday 27th April at 12.30pm in the small hall. Order forms for the uniforms have been sent home or are available below. They need to be returned with payment by Friday 4th May. The next Parent Council Meeting is on Monday 23rd April at 7pm, during this meeting we will be doing some of the activities for the Playback self evaluation and starting to get organised for the summer fair. As ever would welcome anyone who would like to be involved. This week the P6’s visited Edinburgh Zoo to learn about the Cycle of Life as part of their health education. During the visit we had the great privilege of getting to see the Giant Pandas everyone was very excited about this including the teachers and parent helpers! Tian Tian (Sweetie) the female panda is the one you’ll see in the photos moving around as she is a good climber. Yang Guang (Sunshine) the male panda is the one doing all the eating he got through a lot of bamboo when we were there. Yesterday we went hill walking in the Pentlands! We climbed to the summit of Caerketton Hill and then came down to have lunch. We used binoculars to look over Edinburgh. The view was fantastic! We saw Edinburgh Castle, Arthur’s Seat, the Firth of Forth and all the way to Fife. We went down the side of Hillend Ski Centre and went down a steep hill. We went down by the Hillend café and into the minibus. We had to take a lot of gear with us like waterproof jacket, water proof trousers, hat, fleece, socks, gloves, emergency tent, emergency sleeping bag and a flask of hot juice. 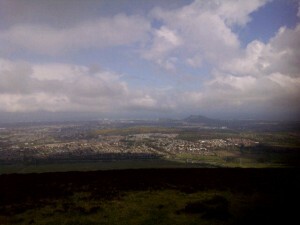 On the 18th of April, 2012, P7 took a walk through the Pentland Hills. We went to Penicuik High School to get geared up and we had to be wearing: strong hiking boots, thick waterproofs and warm clothes. We also had to bring an emergency tent, sleeping bag and a flask of hot juice. We walked from Boghill Farm to Caerketton Hill which is the highest hill in the Pentlands and we climbed up to the summit. We could see Arthurs Seat, Edinburgh Castle, The Firth of Forth and across the sea to Fife. At the top, there was a stone pile so we all got a stone and placed it on the pile and then went back down for lunch. After Lunch, we walked past Hillend Ski Slope and down towards the car park where we ended our journey. Today was a weird, wonderful and absolutely awesome day! We went hill walking at the Pentlands but before all the on the way there on the bus Owen was telling ghost stories. But before we go on to all the ghostly talk here is how our day went. The day was an aching, moaning, struggle with us wanting to stop every two minutes while climbing a hill in the Pentlands called Caerketton. When we eventually got to the top (it was worthwhile) because we saw an amazing view and we also got a photo taken at the summit of Caerketton (a pile of rocks). But this turned into a creepy mystery at the end because Owen was telling ghost stories and Kyle and Owen looked into the binocular lens and saw a creepy face and other spooky things also happened. It was an amazing experience to try out. What a day!!! We went to the Pentland hills for journeying. We had to walk through the hills. It took all day. It was too long for me and I was very tired. The group was too! At the start we were all quite nervous. Then we went to Penicuik High School to get all the equipment for us to go out up the Pentlands. Our group went the steep way which was tiring. When we stopped for lunch we had to go down this big steep hill with a really muddy path. And we all tried to climb up a tree over a river and Jade and Emma F fell in. We all had a fun and went home. At the beginning of this fabulous day out of school, we got in the minibus and went up to the Pentlands! When we arrived we went through some safety rules, then we headed up the hill! Half way up the hill we stopped for a snack. Then we cut through a field and had lunch. We finished our journey quite quick so we played some fun games down by the river. We climbed a tree that had fallen over the river and Jade and I fell in!!! It was a fun day and I would definitely do it again!! Firstly we got on the bus and went to Penicuik high school and got all of the things we needed to take. After we were ready, we got on the bus and drove to the Pentlands. When we were there we had our snacks then we got off the bus and started our journey. Muriam and I were the only girls in our group with Kyle, Lewis, Frazer, Owen and Matthew. Today was great but tiring too!! We had a few giggles and had a few screams then we had to go through squelching mud and had to climb up the highest hill. It was a struggle to get up but when I got to the top I was really proud and reached my goal. We had lunch and then went for a walk and I went over on my knee. We felt nervous at the start because we didn’t really know what we would be doing up there. First we went to a high school in Penicuik to get our gear to walk up the Pentland hills. We needed: walking boots, a bag, waterproofs, hat, gloves, socks and a jumper. Then we set off to the Pentlands on a mini bus. Our leader was called Eric, we started right at the opening of the ski slope. We were at the end because it was very steep and everyone else walked in front of us. At one point Sophie fell on top of me and then I fell down and then started rolling down the hill. When we got to the top of the hill we walked down to a lower hill to have our lunch. After lunch we had to walk through muddy fields and through a farm and back to the high school to clean up our boots and put our waterproofs away then we came back to school. Firstly we all got in to groups and we had all girls in our team. We had: Emma, Emma, Katey, Sophie, Amy, Jade, Alex and Toni! Eric and Roma were our leaders for the day. We got in the minibus and we went to the unit to get ready. We took a rucksack, hat, gloves, fluffy socks, jumper, waterproof jacket, water proof trousers and most of all – hiking boots!! Then we got on the minibus and went to the Pentlands! We started our walk from Hillend in first car park and then we started our big walk. We kept on having rest to keep us going and then we had lunch! After lunch we set off again! We got to a marshy field and we had to walk through. It was kind of fun! We got to a stream and there was a tree so we got to climb it over the river! And that was our adventure on the Pentland Hills!!! For their class enterprise, P6 chose to raise money for the charity ‘Sashita‘ which raises money to improve village life in Tanzania. At present, women and children walk to a well to find water; not all children attend school; 7 out of 10 adults cannot read or write; and 99% survive on less than £1 a day. P6 will be holding a coffee morning on Friday 27 April 2012, in the small hall between 9.30-11.30 to raise more money for a holding tank for a village well in Samuye.